Summer is almost here and it's a fabulous time of year , but of course I am a gardener!. I like this time of year because i see so many new events happening. New leaves unfurling on the end of trees branches, new profusion of blossoms in the flower gardens, the new kinds of birds Mum has attracted to the feeder in the newly sprouted pea patch, newly tilled veggy garden, new berry bushes and veggy transplanted in straight rows, a new crop of garlic. My first favourite event at this fabulous time is the new rapid growth of the asparagus, the first veggy crop to be harvested. Peak season came on fast in the first week of the harvest and is continuing to be good. Something new occurred in the asparagus patch this year that i have not seen yet, and that is the asparagus beetle must have been reduced in numbers by the harsh winter we just had because there just aren’t many out and of course that means the spears are not damaged by the them feeding. Wish winter was harsh on all the pesky black flies and mosquitoes too! My next favourite event is the emergence of 17000 garlic plants. They look great this year, at least the above ground parts that i can see look great. I walked through the patch with my note book this weekend and noted which varieties and strains are doing the best and which are not. Some are displaying cold damage by having yellow tips on the ends of their leaves. Not to worry, they will recover. However there are some that never put on a show of dark green leaves and hardiness, but they always produce a good crop of bulbs any way! Some strains are currently undergoing a vigorous assessment as to which ones i am keeping and which ones i may not. Baba Chesneck and Purple Glazer are looking not too bad and should be keepers. Others are just struggling too much to even give them a second chance. Kazakhstan, Romanian, Armenian and the Carpathian have been added to my collection in the last 3 years and they are doing phenomenal! These will available in September. 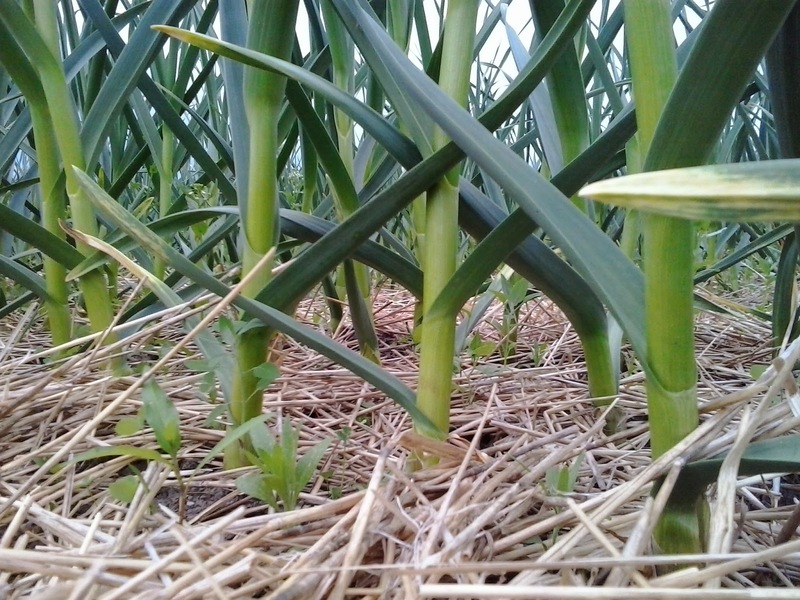 Two new daily tasks have been added to my schedule this week; the process of weeding the garlic and inspecting for the leek moth larvae .Alas, this winter was not harsh enough on them and they are still around this year. First egg laying session has already taken place, and today i even found some have already settled higher up on the garlic leaves to metamorphose into a moth. So as I weed, I squish! And while I am removing vegetative and insect pest, i am planning for the third annual Garlic Harvest Crop Mob! I will be talking about this for the next 6 weeks or so. Tentative dates are July 15th , 22nd or the 29th. I expect the garlic harvest to occur much earlier than it did last year! So stay tuned on Facebook, twitter and here for more information. My third favourite event is planting my personal garden. New this year is that the top half of the garden will be in fallow, planted to white clover seed in to let the land rest for a few years. I will continue to use the cold frames and boxes for the fussy plants such as herbs and celery as well as continuous lettuce and greens planting. The rest of the garden is in all the typical garden veggy selection. Something else that is new this year is a Let's-see-if-this-works project, i planted Saskatoon berry trees and haskaps bushes. These are replacing the gooseberries and the black current bushes that have never produced well for me. (maybe because i really don’t like them) Saskatoon and haskap produce their blueberry like fruit in June which is my least busiest time in terms of harvesting. I am hoping they will be excellent in smoothies, if not, at least they will be good in pies and jams. So with a full plate of activities on the veggy farm I am one very busy gardener.